The first serious suggestion that the two sides come together to end the war came neither from London nor Washington, but from St. Petersburg. Czar Alexander I of Russia, eager to trade with both countries, wanted to end the war and thereby make high seas commerce safer and more lucrative. In March 1813 he offered to host mediations. Madison accepted immediately, but the British, who were doing well in the war, were in no mood to talk. It wasn’t until fall of that year, after the defeat of Napoleon at Leipzig, that British foreign minister Lord Castlereagh offered to negotiate directly with the United States. 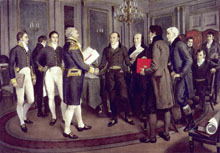 In January 1814 Madison agreed to peace talks in the neutral city of Ghent in Belgium, and sent off a curious collection of intellectuals and politicians to run the negotiations. John Quincy Adams, serious, disciplined and devout, was the chief negotiator. Son of a president and the U.S. minister in Russia, he was often unhappy with one of his colleagues at Ghent, the card-playing War Hawk, Henry Clay. Both men were strong negotiators, supported by an effective committee: Albert Gallatin, secretary of the treasury; James A. Bayard, a moderate Federalist; and Jonathan Russell, the chargé d’affaires for Madison in Paris. Adams and his team had one goal – restore things to the way they were before the war, the status quo ante bellum. The British negotiators were more ambitious; they wanted uti possidetis, that each side could keep what it had won during the war. For example, Britain had, for a time held Detroit, and still occupied Mackinac Island. But the preeminent goal on both sides was an end to the fighting. Britain had spent ten million pounds fighting the Americans. The United States was nearly bankrupt. So the jockeying for position began, as the negotiators pursued their goals with an eye toward a quick resolution. Still, the British upped the ante. They demanded territory in northern Maine, demilitarization of the Great Lakes and navigation rights on the Mississippi. The Americans, force to wait weeks for instructions from Washington, had to stall. They spent their days arguing fine points -- with each other and the British – and their nights socializing and attending the theatre. Adams, an abstemious early-riser, resented Clay’s late-night card playing and carousing. But they held together a united front when pressed by the British for concessions. The talks dragged on and on, while events in North America, reported in the European papers, affected the strength of each side’s positions. In just the first three months of negotiations Washington was burned, Baltimore defended, Prevost turned back at Plattsburgh. Still, the border between the U.S. and Canada had not changed. The advantage seesawed between the teams, neither having enough leverage to claim a full diplomatic advantage. Facing unrest at home and on the European continent, Lord Castlereagh turned to the Duke of Wellington for advice. The British Navy had failed to control the Great Lakes, British Army had failed to occupy substantial territory in the United States. The Duke’s advice was blunt – take the status quo ante bellum and be done with it. By Christmas Eve, 1814 the weary negotiators had agreed on the order and syntax of 3000 words in eleven articles. When approved by their respective governments all hostilities would end and “all territory, places and possessions whatsoever, taken by either party from the other during the war” would be restored as they were before the war. In short, no one won a thing. Impressment, a major cause of the war, was not even mentioned. Article IX contained a tragically unenforceable clause for the Natives. The belligerents agreed to restore the Indians to “all possessions, rights and privileges which they may have enjoyed, or been entitled to in 1811.” But without a clearly-drawn map of Native land reserves, this clause was meaningless. Tecumseh’s confederacy was irretrievably destroyed, and Harrison’s victories could not be reversed. The Natives were simply in the way. 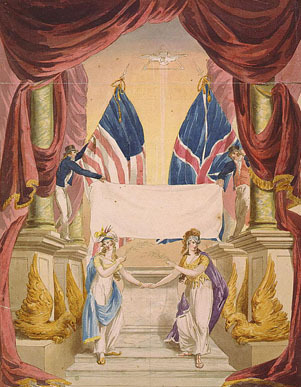 “A Treaty of Peace and Amity between His Britannic Majesty and the United States of America” is the last peace treaty the two countries signed with one another. The British finally accepted the United States as a legitimate national entity; and the United States, in turn, gave up its designs on British territory in Canada. The war had been a stalemate whose resolution let each side get on with the business of trade and expansion. In the end, they simply agreed to call the whole thing off. 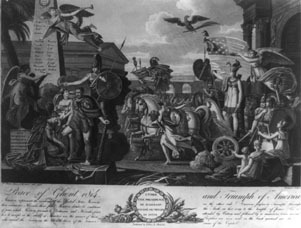 Peace of Ghent 1814 and triumph of America. 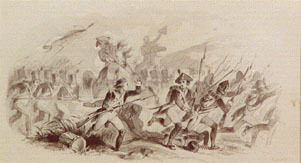 Battle scene with line of bayonets.